With undeveloped beaches, thriving wetlands, thick forests, and of course, spectacular mountains, North Carolina is a nature lover’s paradise. From east to west, from dawn to dusk, hiking, kayaking, bird watching, and enjoying the incomparable sunsets, there's a splendid surprise at every turn. 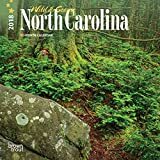 Admire the abundant natural beauty of the Tar Heel State in this exquisite Wild & Scenic North Carolina square wall calendar. With undeveloped beaches, thriving wetlands, thick forests, and of course, spectacular mountains, North Carolina is a nature lovers paradise. From east to west, from dawn to dusk, hiking, kayaking, bird watching, and enjoying the incomparable sunsets, there's a splendid surprise at every turn. 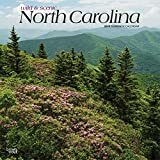 Admire the abundant natural beauty of the Tar Heel State in this exquisite Wild & Scenic North Carolina mini square wall calendar. The North Carolina Literary Hall of Fame celebrates and promotes the state's rich literary heritage by commemorating its leading authors and encouraging the continued flourishing of great literature. It is more than a museum housing photographs and archives. Working closely with libraries and schools, the North Carolina Literary Hall of Fame honors North Carolina writers through programs, services, and opportunities for children and adults. It is located in Southern Pines, North Carolina. Those who collect all 12 stamps before the deadline will also be entered into a drawing for two people to attend the 2020 NC Literary Hall of Fame author induction ceremony in Southern Pines which includes a night for two in Southern Pines and some special "behind the scenes" activities. Wow! For all who collect all 12 stamps from each store in the Indie Calendar before Independent Bookstore Day on Saturday, April 27, 2019 (Independent Bookstore Day!) you'll receive a 20% discount card good at all 12 stores for 2019! The calendar also features a list of all North Carolina Independent Bookstores- all are members of the Southern Independent Booksellers Alliance! With undeveloped beaches, thriving wetlands, thick forests, and of course, spectacular mountains, North Carolina is a nature lovers paradise. From east to west, from dawn to dusk, hiking, kayaking, bird watching, and enjoying the incomparable sunsets, there's a splendid surprise at every turn. Admire the abundant natural beauty of the Tar Heel State in this exquisite Wild & Scenic North Carolina square wall calendar. 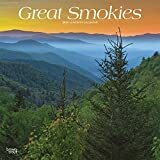 Size Open: 12" x 24"
The Great Smoky Mountains, which rise on the border between North Carolina and Tennessee, stretch from the Pigeon River in the northeast to the Little Tennessee River in the southwest. This subrange of the Appalachian Mountains is home to Great Smoky Mountains National Park. This beautiful square wall calendar includes images of the Great Smokies’ ancient mountains, lush forests, and abundant plant and animal life.